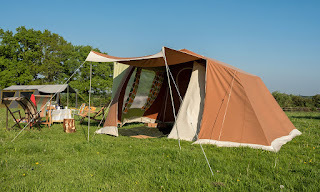 The Grunderful is a 70’s tent which sleeps up to 3 people. The cosy tent has lots of head room, a classic rounded stable door opening, window with original 70s curtains and an optional porch. Thursdays to Sundays we cook up a wonderful breakfast or evening meal. 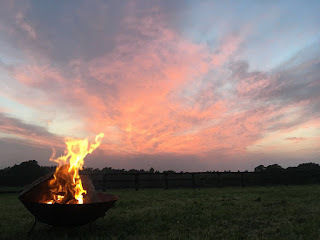 Usually created over a woodfire or charcoal, breakfast consists of tea or coffee with huevos rancheros, a bacon sandwich, grilled bread rubbed with garlic and tomato or porridge. Dinner could be grilled meat or fish and salads or hearty stews with gremolata and homemade flatbreads. Lots tables and chairs are provided around the camp kitchen.